IWAI is the voice of waterways users and enthusiasts. It represents the views of members to governments (NI & RoI), to the cross-border navigation authority Waterways Ireland, and other navigation authorities, to local authorities and the range of statutory and state-sponsored bodies whose activities impinge on the waterways in one way or another. Waterways Ireland is one of the six North/South Implementation Bodies established under the British Irish Agreement in 1999. Waterways Ireland manages, maintains, develops and promotes over 1000km inland navigable waterways principally for recreational purposes. 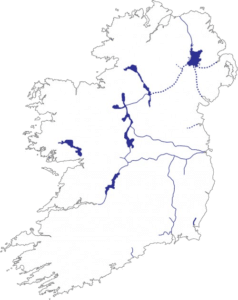 The waterways under the remit of the body are the Barrow Navigation, the Erne System, the Grand Canal, the Lower Bann, the Royal Canal, the Shannon-Erne Waterway and the Shannon Navigation.